I am a skincare-a-holic. It's no secret. I am just obsessed with finding the latest products that do more for your skin than cover up a scar or hid a pimple. I am all about addressing the root causes! And I think you guys like that, too! You want to know what I find to be working really well, and since I love to share, I think we have a great relationship going on, don't you?! I had been wanting to try Eve Lom for so long, primarily because I heard such great things about their simplistic approach to skincare. Their focus? Truly radiant, flawless, and cleansed skin, in the most gentle way. The Original Balm Cleanser is a cult classic so I knew I had to start there. Want glowing, radiant skin? Want the most luxurious feeling cleanse you'll ever have? Look no further. This balm feels extremely silky on your face, it exfoliates and cleans, and it comes with a muslin cloth that works miracles for removing makeup (yes, eye make up, too). The smell is so heavenly and it's also packed with plant oils and other great ingredients (cocoa butter, eucalyptus, chamomile, clove) to work its magic on the skin and target every need. I actually look forward to cleansing my face every night. Using this cleanser has made my nightly routine that much more enjoyable! No joke! I have seen gotten hooked on Eve Lom's other products, such as the Rescue Mask and Face Mist. Oils are truly a magnificent addition to your skincare regime. Ever since I started using them, I have not been able to stop. The Huile Prodigieuse by Nuxe is a dry oil that hydrates your body and hair and leaves the most gorgeous sheen to your skin. It's the summer, and adding a bit of shimmer to my legs is top priority, especially for someone who doesn't sit out in the sun. It's packed with plant ingredients with over 98% of ingredients derived botanically. It's French, it's fabulous and did I mention you'll smell like a French woman? Seriously who doesn't want to smell like a French woman? Yes, more oils! The Rosehip BioRegenate Oil by Pai is another luxury skincare essential. It's no wonder this is one of their best sellers. First of all, did you know Pai means goodness? Not only are their products good, but they are good for you! Want firm skin? Glowy, dewy skin? What about riding yourself of lines, wrinkles, patchy skin and scars? Rose-hip oil is known for its regenerative properties so you can watch it heal your skin, and protect against future stressors. I love slathering it on before bed or mixing it into my day cream for a dewy look. It actually creates a bronze effect on your skin! No sun necessary. Ever since I first discovered Rodial Beauty on The Beauty and the Vlog Podcast I knew I had to try out the line. I was so inspired by founder Maria's story of entrepreneurship and early career days. For my first products, I knew I wanted to try the Dragon's Blood range. I tried out the Essence Mist and the Lip Masks. Could they actually plump my lips? I was intrigued. I was so excited that I tested them out the evening I got them! Looking back I should have waited until I was going out to use the masks! But they actually work! They are packed with hyaluronic acid to provide intense hydration and stay moisturized. I woke up and my lips were still plump. Both products are total luxuries, but totally worth it! 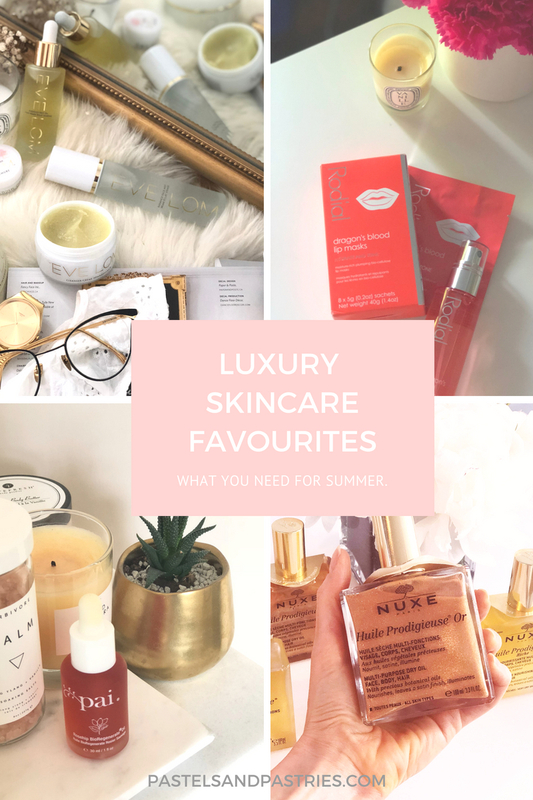 Do you have any skincare finds that make your skin feel oh-so luxe? Are any of these speaking to you? Let me know! And like always if you have a specific skin care need, feel free to ask me for suggestions. I love to help! Brands are also available at Murale by Shopper's Drug Mart. Check out your nearest location for stock! I know! But so many goodies to try :) Start with Rodial!